Cucumber Sandwiches, 4 Tasty Ways! 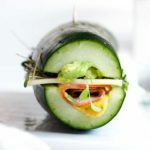 Healthy, tasty and SUUUPER easy cucumber sandwiches are the answer to your low carb lunch requests! Fill them up with cream cheese, ranch, meat and toppings for a keto version of your favorite subs! Cut your cucumber in half. Use a spoon to scrape out the seeds — I like to get each cucumber half as thin as possible before adding the ingredients (thinner than they are in the photos!). Add your sauces/spreads (mayo, mustard, cream cheese, avo, etc). Then layer the remaining ingredients. Slice your sandwiches in half, and enjoy! Nutritional information will vary with which toppings and how much of each you use — all the variations above are low carb inspired “sandwiches”. 4 slices of turkey, 2 slices swiss, 2 tablespoons yellow onion, 1/4 cup sprouts, 1/2 avocado mashed.